Wood Samurai Daito Sword | BUDK.com - Knives & Swords At The Lowest Prices! Practice your sword moves without damaging your sword! 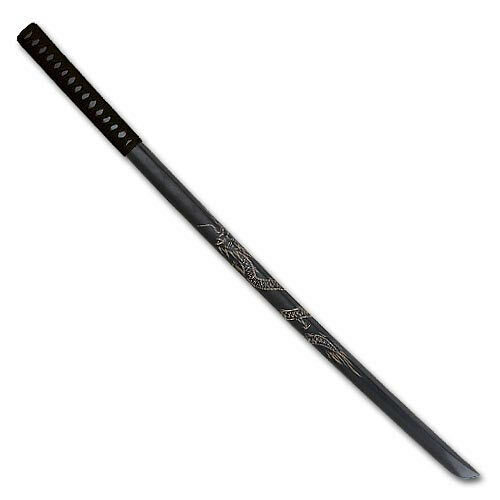 This piece is an excellent traditional training tool for the samurai sword enthusiast who wants to perfect his sword strokes but fears causing unwanted damage to his weapon. Stretching 39 1/2" overall, this wood sword is constructed from one solid piece of balanced hardwood. The grip is wrapped with nylon cord to give the user firm control. The wood is intricately etched with Oriental dragon designs to give this piece beauty as well as utility. This sword will give you excellent training value at a super price!